Where Fate Ends and Creation Begins. I'm just back from exciting week of events along the west coast of Lake Michigan which ended in Chicago on Friday. 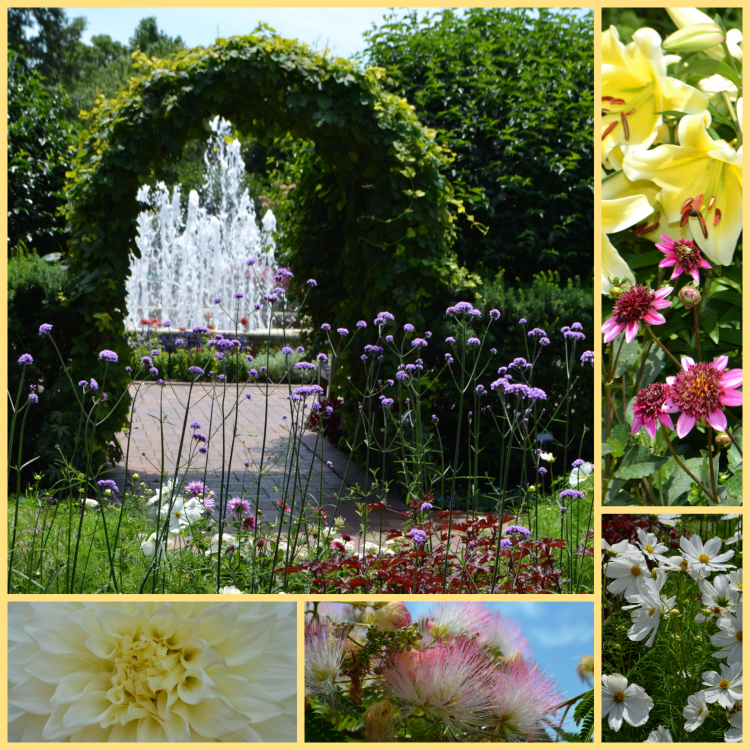 The weather was just gorgeous, so I decided to spend a few hours at the Chicago Botanic Garden photographing flowers to use for my Facebook inspirations. I make it a point to seek out Botanic Gardens anywhere I travel and this is one of the best I have had the pleasure of visiting. The rose garden is superb; the air so thick with heady perfume you can almost see it floating by in wafts of brilliant color. Yes, it's THAT amazing. Practically psychedelic. After a long week of travel and readings I was thankful to find a quiet, shady space, tucked away in one of the formal gardens. It gave me a moment to sit, savor my surroundings and meditate before that evening's event. The place was perfect, but in spite of the peace that surrounded me, I couldn't empty my mind in that moment. I kept thinking about conversations I'd had over the past few weeks with other intuitives. The hot topic: Where Does Fate End and Creation Begin? As I see it, there are situations in life, horrible occurrences like the death of a child, that I will never be able to comprehend. At times, I have to surrender to the knowledge that some things are fated to happen. There is a higher divine order that I do not fully understand. At the same time, I believe fervently that we are the creators of our lives. We are the artists who apply color and form to the canvas; the authors who write the lines; the directors who choose the actors. I looked around me and saw nothing but order and symmetry; a picture of complete balance. I noticed the perfect positioning of an ivy arch which formed a striking frame around the water fountain in the adjoining garden. Each space lead logically to the next. The flowers themselves were layered and arranged for size and color play. The juxtaposition of bright, purple cosmos and a vibrant yellow lily allowed each to give the other added luminosity. Everything seemed to have been planted next to its neighbor with extreme thought and care. "It's a completely magnificent example of what we are capable of creating," I thought. Nature in its raw form is incredible, too. I can still visualize the snow-capped mountains and green lakes I saw in Boulder, Colorado this April. In my mind's eye I can see the wild grape vines, fields of phlox, and dank woods I speed by on the bike trail near my home in Wisconsin. And my favorite: the glowing blue water of the Caribbean...yes, the Universe does glorious work with its natural habitats. Yet, there is just something about a formal garden that tells me to stop resting on my ideas and make things happen. As we all know, it's hard work creating a balanced, gorgeous garden of a life. You have to first clear the land of old debris--and those bulldozer lessons are painful! Then you have to construct a plan, which begs the question: what is possible for this space, for this life of fertile soil? And, how limiting is our thinking? Onto sourcing, planting and above all else nurturing our creation. We have to accept the seasons, and find the beauty in a snow-covered garden, in the dead of winter, where nothing seems to be happening. We are the gardeners. We plant what we eventually harvest. Every thought you think contributes to your reality. You have to perform hard labor, nurture relationships and be constantly willing to change. You have to be clear about what you want and vulnerable enough to voice it. Yet we are not alone in our quest for a beautiful life. The unseen world around us is here to help, and the message they are sending is, "Be a powerful creator!" Don't hand over control of your life, dreams and hopes to anyone, including "fate." You have the power to grow the life you dream of having. Get inspired. Immerse yourself in some heavenly creations, cultivated by humankind. Take the lesson from a garden, and cultivate a life of deep meaning for yourself. No one else can plant what you want in the deepest parts of your soul--no one else can even imagine it. Beauty longs to grow up around you, to enfold you with perfumed petals and giant blooms. But first, you must till the soil.